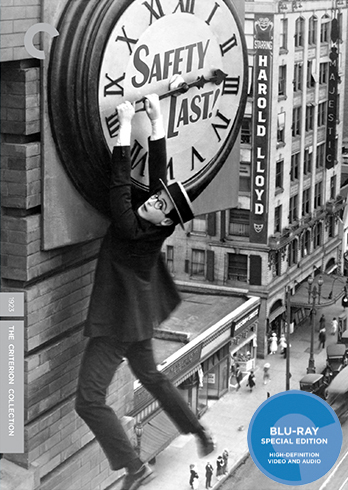 The most iconic film of Harold Lloyd's career and one of the most iconic in silent film period, Safety Last! is every bit as entertaining as its reputation suggests -- perhaps more so when you consider nearly all of the film's choice gags come before the climactic clock-hanging climb. That final sequence is a marvel of forced perspective and plain old daring, a white-knuckle thrill just as likely to make your palms sweat as it is to make you erupt in (probably nervous) laughter. Lloyd's lauded everyman persona is seen in the way he spends the whole film striving, striving, striving, until it almost kills him. Safety Last! doesn't have the knowing cynicism of Keaton or the romantic sentimentality of Chaplin, but it's both pointed and poignant in its depiction of a man's conception of success. Lloyd's eponymous protagonist leaves behind his girlfriend (Mildred Davis) in their small hometown to pursue his dreams in the big city with the promise that he'll send for her once he's established himself. His hard luck doesn't stop him from putting on airs -- expensive jewelry and notes of his business prowess make their way back to his girlfriend frequently while Harold can't afford to pay the rent or feed himself. From her perspective, he's clearly financially ready to establish a home with her, so she goes to surprise him, forcing Harold to construct an elaborate charade at his department store job and take on a risky stunt in hopes of a financial windfall. The gags build in complexity and length as the film goes on, but some of the best are the early sight gags, bits of pure visual genius like Harold and his roommate hiding in their hung-up coats when the landlady comes calling or Harold sneaking into work late disguised as a mannequin. The frantic balancing act of later sequences -- Harold pretending to be store manager in his boss's office, the 12-story climb -- are perfectly paced examples of comedic tension. Safety Last! is one of the greats, and based on Criterion's presentation of it, we have a lot to look forward to as they continue to roll out their Lloyd titles. Presented in 1.37:1 and 1080i to account for its 22 frames per second frame rate, Safety Last! looks absolutely incredible, with a consistently tack-sharp image, perfect contrast levels, excellent grayscale representation and a healthy film-like appearance. The clarity here is just remarkable; this is certainly one of the greatest silent film Blu-ray transfers I've ever seen. There is some damage here and there, most noticeably in a couple instances of tiny vertical scratches during the last act, but this is a fantastic presentation. Two audio options are included -- a 1989 Carl Davis score in uncompressed stereo or an organ score from the late 1960s in uncompressed mono. Criterion has gone all out for their first Lloyd title, gathering a hefty batch of new and previously available material. Critic Leonard Maltin and archivist Richard Correll team up for an audio commentary track that's carried over from the previous DVD edition, while Lloyd's granddaughter Suzanne introduces the film. A feature-length 1989 documentary Harold Lloyd: The Third Genius offers a comprehensive overview of his prolific career. Three short Lloyd films -- Take a Chance, Young Mr. Jazz and His Royal Slyness -- come presented in 1080p with optional commentaries from Correll and John Bengston. Bengston reappears in a fascinating featurette on the film's locations and practical effects along with effects expert Craig Barron. Carl Davis talks about the process of scoring Lloyd's films in a 20-minute interview. The package also includes a booklet with an essay by critic Ed Park. This exceptional release of Safety Last! bodes well for the forthcoming Lloyd catalog from Criterion.